It’s not often as bad as that of course, and if that is most of my list of damage after 9 years its not so bad huh? Or is that the karateka in me talking? What is it that interests me so much and keeps bringing me back? I am not looking forward to the rigour of the test: a whole weekend of training with upwards of twelve senior instructors watching and a three hour test at the end which includes a scrutiny of technique, kata, applications and different kinds of pre-arranged sparring , followed by a elements of strength training, bag work, ten rounds of free sparring and a load of what they call ‘spirit training’ (high reps of press ups etc.) The thought of it makes me feel sick. I can’t even say I always like training. Sometimes it’s really hard and I don’t know quite when that’s going to be: when one of my instructors or even a training partner is going to decide to push at my limits or what just in the general training is going to hit my buttons or give me the fear. Sometimes is not the pain, but just feeling too stupid, unable, small or generally not good enough that hurts. The thing is that while the above is all true it is only a small piece of the whole picture. Training partly involves a lot of detailed technical work on breaking down, perfecting and repeating very precise patterns of movement. 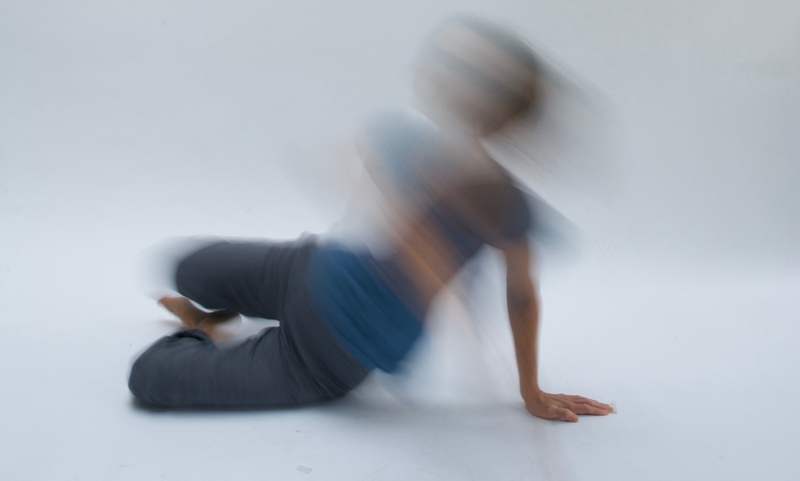 I guess you could find aspects of it boring but to me, as a Feldenkrais teacher, it’s completely fascinating – and hugely satisfying when I improve enough to really begin to feel how it works. Karate – or at least the close-up okinawan style I do (Goju Ryu) with its southern chinese influence – is not just bashing away and blocking, force against force, which I think is how some people see it. Of course that’s a crazy way to go about things, especially if, like me, you would struggle to make the weight for a fly-weight division in boxing. It’s built around foot-work and rapid twisting movements to avoid an attack and yet still be close enough to counter. It’s about sticking close to your partner to control their movement, re-direct their momentum, take them down or take them out. Spirals, circles and counter circles along with gripping/pulling techniques for blocks, locks, chokes and strikes are all in there, as well as very fast direct techniques such as pushes, joint kicks, knee or elbow strikes and a variety of devastating straight punches , open hand or even finger strikes. It has a snappy, explosive kind of movement that has been a wonderful discovery for a slow, soft mover like me. Then there is endurance training. I guess that could be boring too. And yet not. In the crowd at Sensei Linda’s Tooting dojo of an evening for example, a round of front kicks grows and turns into tens and then hundreds, a wild group energy takes hold with the kiai (shout) that starts to mark every ten kicks and the energy just keeps building as no one knows when she will eventually call a halt. One friend keep telling me it’s built for eighteen year olds so why am I doing this at fifty? Because actually I can! And its great to feel I can! Training is for me endlessly interesting and invigorating. 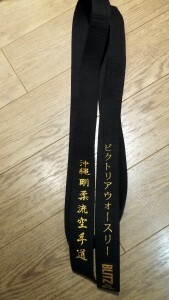 That I might actually be good enough at any of it to reach black belt astonishes me. The idea of giving it up is horrible. I don’t want to lose this new version of me – I don’t mean the broken one on the table of course, but the one that can move with so much more power, speed and clarity. There is so much in it to play with and discover and learn. What’s not to like? I could cite the new patterns of movement, new strength combined with a functional flexibility, better understanding of transmission of force, opportunities to explore aspects of Functional Integration (hands-on Feldenkrais work) through working with locks, redirection of motion and taking another’s balance, better understanding of skill-strength and many other aspects of Karate that my Feldenkrais practice continues to benefit from and which I may write about later, but right now what shouts the loudest as the reason I am still hanging in there is the term CROSS-MOTIVATION. I have written before about the incredible clarity of intention and execution demanded and trained in the martial arts that makes even a well-executed kick, grab, take down or lock a beautiful thing to watch or do. I don’t mean the slow flowing movement of Tai Chi or the expansive flow in forms of Kung Fu – widely acknowledged for their beauty – but the incredibly fast and cruelly direct techniques of Karate. A friend recently pointed out to me that I am clearly very attracted by the ability to take action in a pure and simple way, untrammelled by the complications of feeling or emotion, and that I don’t have a hope in hell of achieving it. He didn’t mean it badly, and he is also right. Although I might have put it a little differently. For an action to be clear and precise (in the way Karate demands for example), it needs not be hampered by cross- motivation. Or so Feldenkrais said. Cross-motivation is when part of yourself is working against, or getting in the way of, the very thing you are trying to do. This is not the healthy weighing up of pros and cons regarding a course of action, but the unconscious internal contradictions that muddy one’s ability to enact any intention clearly and well. It was very key to Feldenkrais’s thinking. His desire was to enable people to go beyond the constraints and conflicting push/pull of internalised parental or social control so that they could become truly mature human beings, able to respond simply and clearly in any situation and make their own choices with clarity of purpose. He understood that cross-motivation often becomes wired in as a result of inevitable childhood dependency that is never perfectly managed but sometimes involves manipulation, too much control or outright abuse. He saw that this is a physiological event as much as it is mental, and that in fact the two are not separate. Such cross-motivation is there in our movement, muscular tension, the way we take (or don’t take) our support from our skeleton and the ground – indeed our every breath. If its not clear what I mean, imagine a baby who learns bit by bit to reach for a toy. First her movement is random: arms and legs waving. Then a toy is struck by accident perhaps. The baby’s attention is caught. She has felt the touch and seen the toy wobble or fall. It happens again. Exciting. She has done something that has made something happen. Gradually she begins to refine her movement to re-create the event, pruning away unwanted movements to direct herself to this end more effectively. The toy is struck. The toy falls – a little less randomly maybe. Over days and weeks the baby will learn to clarify her movement so that she can reach the toy better. Unnecessary waving falls away, the direction of movement becomes clearer. Eventually the baby discovers how striking a foot against the ground creates a push that helps her roll and reach better, and so on. She hits the toy, she reaches the toy, she grabs the toy, she gets it to her mouth! It’s a wonderful process to watch. But what if you shout at this baby when she reaches for the toy? She will flinch. Her stomach muscles will contract, Her arms will be thrown outwards and she will go into the ‘startle response’ or ‘moro reflex’ which is one of the few things deeply wired in from the start. Do that every time she goes to reach for the toy and it will begin to affect her pattern of reaching. Very likely she will no longer want to reach for the toy at all. But if she does, that glorious, pleasurable, lengthening reaching movement she was developing is likely to be compromised by the anticipation of danger. As she starts to lengthen to reach for the toy, her system will be contradicting the movement already by contracting in fearful anticipation. What happens if this becomes wired in? It is likely to become an unconscious part of her pattern of reaching unless she has enough other kinds of experience to teach her something different again. This is ‘cross-motivation’ (as I describe it in my book for actors too). And of course it can happen at any point in childhood or at any time later if experiences are strong enough or repeated often enough. Being told we must behave like this and not like that and feeling threatened in passive, invisible, implicit ways can all affect us as well as outright violence or verbal abuse. The simple fear of social exclusion, parental abandonment or perceived failure and the desire to fit in and be approved is powerful. All of it creates patterns of behaviour which are held in our nervous system and show up in the base level of muscular tension timing and organisation of our skeleto-neuro-muscular system, i.e. the way we stand, breathe, shake hands, reach, laugh, walk, sit – and try to do Karate. Feldenkrais brilliantly realised that as this was the case, it also meant that you could work with movement to address cross-motivation, rather than attempt to wade through the defences of someone’s memories and thoughts. Hence the Method. But in a different way Karate enables this as well, because it creates a very clear demand. Cross-motivation has no place in Karate. You cannot block and stop the block in any way because there is not the time and you will get hit. You cannot hold back your punch or you lose speed and power. You cannot collapse and deliver impact. You cannot stiffen up and move fast. You cannot go sink backwards if you need to just go forwards fast. You cannot make even a little preparation or you are too slow or give away the direction of strike. All those ‘parasitic’ movements as Feldenkrais called them, that do not serve the technique have to be eliminated for it to be effective. It becomes very, very clear that that is the job. It used to just feel rude to me to be so blatantly direct, to not hedge my actions with a careful assessment of their acceptability, likelihood of success and possible repercussions. There was an ‘is this ok?’ ‘am i allowed to do this really?’ or ‘I hope this is alright/remotely good enough!’ in my every block and punch. You can go through life without really knowing you are doing it, but it is in your face when you do Karate because you simply cannot do it at all like that. For me those kind of cross-motivations go very deep and are very old, I don’t need to cough up my reasons on this page, we all have our stuff. My friend was right when he said I couldn’t be free of it in a million years – but not entirely. Karate demands I learn. It is strange to find a kind of peace and clarity in something so challenging, and independence in something so bound by rules and traditions, but that is how it is. I need its hard edges sometimes to help me ‘feel the need to re-organise’ as one Feldenkrais teacher put it. On the day I left to go North for my test, a wise older client of mine who has had much to deal with from a war-time child-hood said to me “Victoria, you look …. complete. Co-ordinated isn’t the word. You look complete.” I am obviously not remotely complete as she well knows, but she was onto something. For me Karate helps me find or restore some of the pieces of myself I had lost, buried, forbidden or just not allowed to develop that the Feldenkrais Method could not entirely reach on its own. And I will keep doing Karate from the sheer relief and pleasure of freeing myself from those self-perpetuated restrictions even though it will, no doubt, continue to be a tough teacher at times. 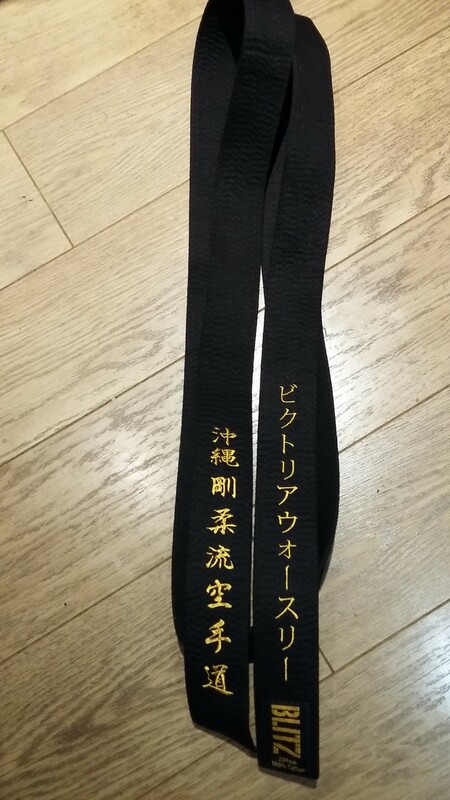 I passed my black belt test in traditional Okinawan Goju Ryu karate(through the EGKA which is part of the the IOGKF) on December 4th 2016– and passed it well at that. 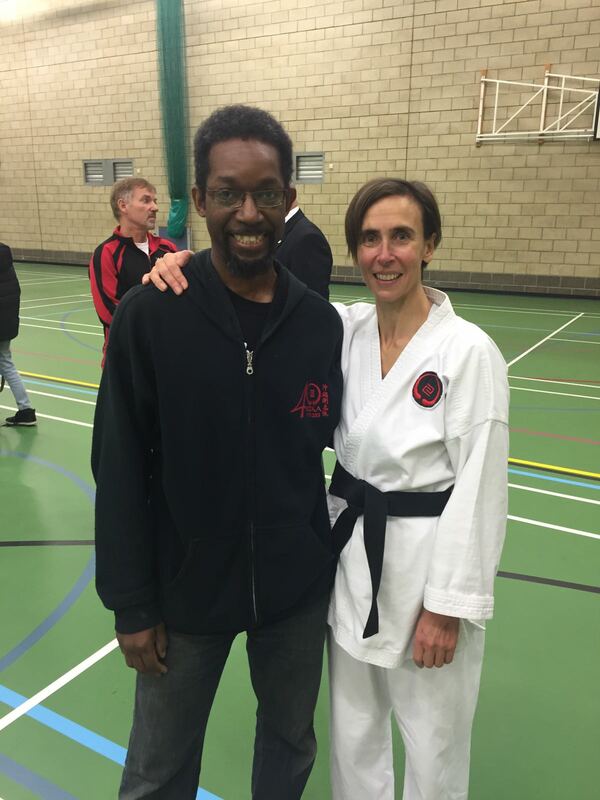 I am very grateful to the wonderful teaching (and great patience) of my instructor Sensei Kevin Goodman and also to Sensei Linda Marchant whose example has been very inspiring on many levels. I am also grateful to all those with whom I train and my daughter Laurel without whom I would never have started this journey and who got her junior shodan a week before I got my adult one! here I am, shattered after the grading, with Sensei Kevin. And yes that is my belt at the top of the blog. with my name on it in katakana. A very personal and heartfelt post Victoria. Congratulations on your Shodan. It made me ask questions about my own Karate experience. What did I get from it? I think it gave me an insight into a hidden side of myself. I trained and trained but saw little improvement. Only when I stopped and really took a deep look inside at why it wasn’t working did I improve. I realised I was trying to copy or emulate other people’s movements. I needed to take a deep look at MY SELF to find the answer. Why didn’t the kick/punch work? If I tense my fist a little later does this work better? Endless questions about my self and body. Eventually I reached the stage where I could compete at a National Level. Then there was no time to think. The body knew what to do. It was a wonderful feeling of freedom. Freedom from thought. Although the stakes were high and a slight mistake was punished quickly the victories were sweet. And that was enough for me. It gave me enough insight to walk away from Karate. But it’s still in my body. The evasions, twists, punches and kicks are part of me. And when it’s quiet and no one’s about I still secretly practise! Rob thanks so much for this – I don’t know why I have only just seen it! great response. yes. Your journey will resonate with many I think. as a feldie I came to it backwards in a sense in that I was in it for the questioning. doesn’t make it easier though and I am not sure I was prepared for what the questions would be for me on a deeper level. yes I can see there can come a point where you have what you came for. I’m not there yet. I like to think of you practising in secret! I am so impressed by your achievement Victoria – doubly impressed a black belt and a book! Your writing about your path to both is very inspiring … I found myself wondering if I should try Karate … well, maybe 65 is a bit late but perhaps something in a gentler tradition as the crossover is so interesting. The sense of acting so much in the moment without checking for approval is exhilarating and I think must be liberating. Thanks so much for writing about it. thanks Lynda!if you find a decent not to crazy class any martial art is great. it does of course get harder to start later if it is a full contact form but here are ways and ways of approaching it. It is indeed very interesting for a feldie…… we can talk…. ps I don’t know why I didn’t see this before Lynda! sorry for the delay!